The Mississippian Indians living in Arkansas and the mid-South experienced their first encounters with Europeans when the Spanish explorer Hernando de Soto entered the Mississippi Valley in 1541. Soto sailed in 1539 from Cuba to Tampa Bay along the west coast of the Florida peninsula. From there, he set off on a four-year exploration of the interior Southeast. His goals were to establish Spanish claim to the lands he explored, impose dominion over native communities, and seize gold and silver as he had done years earlier in Middle and South America. Soto died before his expedition ended. He established no lasting Spanish claims, his army inflicted severe harm on many Indian communities while conquering none, and he discovered no gold or silver among Southeastern Indians. The bedraggled remnants of his army escaped down the Mississippi River to Mexico in 1543. Hernando de Soto, by Gary Simmons. Soto landed in Florida with more than 600 soldiers and officers and a handful of government officials, support personnel, and priests. The army traveled with armored horses and war dogs, and a drove of hogs to serve as an emergency food supply. Their mode of operation was to travel from one populous Indian community to another, following native trails where possible. At one of the first communities they visited, Soto rescued Juan Ortiz, a survivor of the 1528 Narváez expedition to Florida, who in his eleven-year captivity had learned to speak a smattering of the indigenous Timucua language. Ortiz became the key link in a translation chain that grew longer with each new language the expedition encountered, enabling Soto to converse with Indian leaders. Camping in or near Indian villages, Soto typically demanded community leaders tell him what they knew about gold, silver, or other precious metals: did they possess any of this material, or did they know where it could be obtained? Southeastern Indians quickly discovered that their treasured copper, shell, and mica artworks were not the materials the Spaniards desired. So they generally pointed to other regions (occupied by their own adversaries more often than not), suggesting that there Soto might find what he sought. Spanish expeditions employed Indians to carry equipment. From T. de Bry, America. Rare Books Division, The New York Public Library; Astor, Lenox and Tilden Foundations. Not for reproduction. Carrying no food supplies of their own (for whatever reason, Soto was reluctant to slaughter the hogs), the Spanish army fed itself and its animals on corn taken from Indian villages. In a few days time the army might consume a year’s worth of an Indian community’s food supply, resulting in considerable resentment. More resentment built as Soto seized Indian men, women, and children to carry equipment and supplies, perform camp chores, serve as translators, and satisfy the army’s many other needs and desires. Any resistance on the part of the Indians brought swift and cruel punishment. Soto burned houses, granaries, and crop fields; he tortured Indians; he seized Indian nobles and threatened their lives if disobedience to his commands continued. These actions brought varied Indian responses. Some, curious to learn more about these strange visitors and their odd but intriguing possessions, welcomed the Spaniards despite the obvious risks. Others, who had already heard more than they cared to know about Soto’s cruelties, either abandoned their villages as soon as the Spaniards drew near, or set ambushes hoping to steer Soto’s force in another direction. This tactic seldom worked. Many groups had no forewarning of Soto’s approach and were surprised by the Spaniards’ sudden arrival. These groups, for the most part, were isolated from their neighbors by geographical or language boundaries. Soto’s first contact with Arkansas Indians took place in May, 1541 (on the Old Style or Julian calendar) when his army was camped on the eastern side of the Mississippi River in a native province called Quizquiz (pronounced “keys-keys”). Archeologists believe this was a Tunica Indian community located south of modern-day Memphis, Tennessee. During preparations for crossing the river, the Spaniards were visited by Indians from the province of Aquixo, located across the great river in what is now Arkansas. These Indians arrived in a fleet of 200 canoes, each large enough to carry a hundred warriors. They presented a splendid appearance, organized in ranks and decorated with colorful paints and feathers. Their leader reclined beneath a canopy erected over the stern of one of the larger canoes. 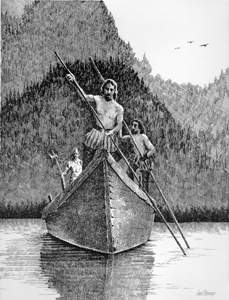 He presented Soto with a gift of fish and plum loaves, and claimed to represent an even more powerful leader named Pacaha whose province lay farther up the river. The ever-mistrustful Soto ordered his crossbowmen to fire upon the Indians, prompting their immediate withdrawal with gestures of disdain. Map of Soto's route through Arkansas and Texas. When the Spaniards crossed the Mississippi River a few weeks later, they marched through the abandoned province of Aquixo. Turning north, they entered the St. Francis River valley and marched through swamps to the province of Casqui. Casqui was a typical Mississippian chiefdom, having existed for hundreds of years before Soto’s arrival. It consisted of several villages organized around a large, fortified town believed to be the Parkin archeological site, now an Arkansas State Park. Archeologist Jeff Mitchem has investigated the Parkin site over several years, excavating in the large temple mound, in areas where smaller mounds once stood, and in residential areas where the Casqui Indians built dozens of houses. Mitchem also discovered the buried remains of a palisade and ditch fortification, along with evidence of the Spaniard’s visit in the form of glass beads, a brass harness bell, and lead shot. Cross-raising ceremony at Casqui, by Dan Kerlin. Courtesy of the University of Arkansas Museum. The Casqui Indians welcomed the Spaniards and provided gifts of food and dressed buffalo hides, even though the effects of prolonged drought had diminished their food supplies. They pleaded with Soto to ask the Christian God, about whom the Spanish priests had spoken, to bring rain to their parched corn fields. 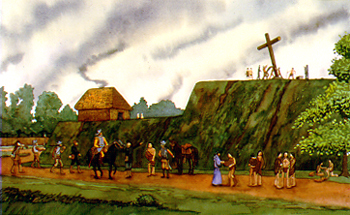 Soto ordered his men to erect a large cross on the temple mound, where the Christian priests conducted a ceremony. According to Spanish accounts, it rained the following day, giving the Indians reason to believe that Soto actually possessed the extraordinary powers he claimed. 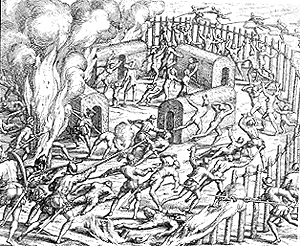 The Casqui Indians consequently led Soto to believe that the Pacaha Indians possessed gold, and so persuaded the Spaniards to join them in an attack on this rival community. A few days later, a combined force of Spanish soldiers and Casqui warriors routed Pacaha’s main town. The Spaniards were impressed by the town’s size and sturdy fortifications, but discovered they had been misled about the existence of gold. The chiefs of Casqui and Pacaha attempted to secure alliances with Soto by offering him marriage to Indian noblewomen. Intent on pursuing his quest for gold, Soto declined these offers and instead sent groups of soldiers to explore the nearby countryside. Finding nothing of interest, the army traveled south along the St. Francis River until they reached the province of Quiguate. The main town of this province was said to be the largest of all the fortified, agricultural towns the Spaniards visited in the Mississippi Valley. There they learned about another province, called Coligua, located in mountainous lands to the northwest. Since gold and silver are often found in mountainous regions (though not in the Southeastern United States), Soto pushed on to that province, crossing wet, uninhabited lands for a week before reaching the “River of Coligoa” (the White River near modern Batesville) along the eastern edge of the Ozark Mountains. The Coligoa Indians had not expected the Spaniards, which suggests there was no regular communication between their area and the Mississippi Valley. But neither did these Indians possess any gold. From Coligoa the Spaniards marched in a southwest direction, passing through several more provinces before entering the Arkansas River Valley. There, they found the town of Tanico (probably another Tunica community) in the province of Cayas. Cayas was a well-populated, agricultural area, but here the Indians lived in scattered farmsteads that were very different from the large fortified towns of the Mississippi Valley. Modern archeologists believe that the province of Cayas may have been located in the Carden Bottoms area, where excavations by Skip Stewart-Abernathy documented Indian settlements dating to the sixteenth century. From Cayas, the Spaniards continued up the Arkansas River (their “River of Cayas”). They entered the northern Ouachita Mountains south of modern Fort Smith. Tanico guides led them to the Tula Indians, whose language the Tanico Indians did not understand. Modern scholars believe the Tula were the ancestors of historic Wichita Indians who spoke a Caddo dialect. The Tula Indians used long lances to hunt buffalo, which proved remarkably effective against the charging Spanish cavalry. Both sides suffered significant losses in their battle, but Soto took no gold and precious little food. With the prospect of cold weather and the hunger of his men and horses worsening every day, Soto led his forces back to the Mississippi Valley, to the main town of Autiamque. There they endured the hard winter of 1541-42, during which their translator, Juan Ortiz, passed away. From that point on, communication with the Indians grew increasingly difficult. In the spring of 1542, Soto moved his army to the town of Anilco. This is probably the Menard-Hodges archeological site along the lower Arkansas River. The town’s residents fled just before the Spaniards arrived. 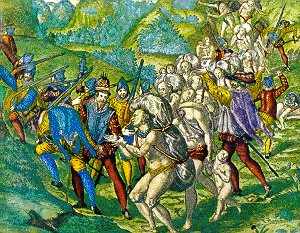 While the Spaniards were there, the Indians frequently returned at night to steal back their corn. Finding insufficient food at Anilco, the Spaniards moved to Guachoya, located along the Arkansas River just above its confluence with the Mississippi. Soto sent out a cavalry detachment, hoping they would discover a route to the sea, but they returned a few days later, having traveled in circles through swamplands. Growing increasingly alarmed at the plight of his army and his failure to find gold, Soto sent an Indian messenger to a powerful chief who lived farther down the Mississippi, demanding that the chief present himself and bring along samples of his province’s most valuable riches. The chief sent the messenger back, saying that he would comply only when Soto dried up the great river. This rebuke sent Soto into a rage. He ordered a brutal attack upon the unsuspecting people of Anilco. Hundreds of men, women, and children were so horribly slaughtered that even many of the Spaniards were shocked. Soto, fallen ill with fever, died a few days later. To conceal his death, his companions wrapped his corpse in blankets and slipped it into the Mississippi River. 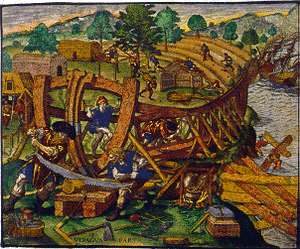 Shipbuilding in the New World. From T. de Bry, America. Rare Books Division, The New York Public Library; Astor, Lenox and Tilden Foundations. Not for reproduction. 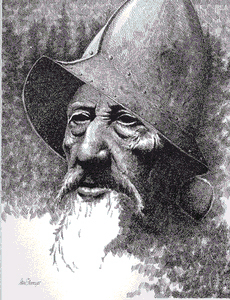 Luis Moscoso de Alvarado succeeded Soto as expedition commander. He led the army via the Red River into southwestern Arkansas and eastern Texas, where they visited and fought with Caddo Indians before abandoning their search for an overland route to Mexico. 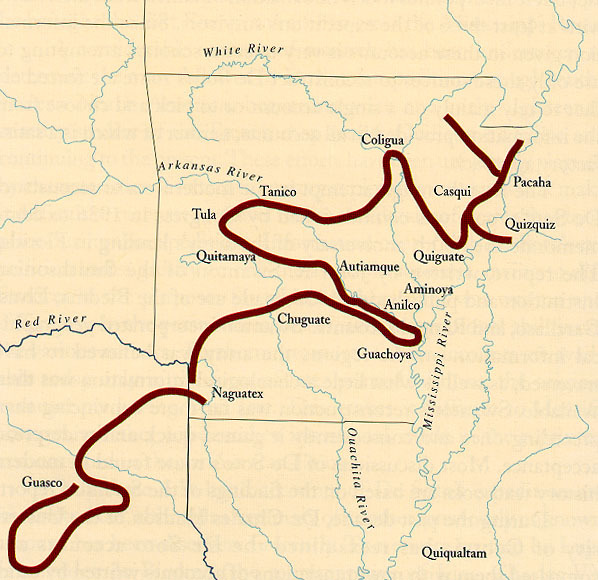 Returning up the Red River, Moscoso led the dwindling army back through Caddo territory and across the Ouachita Mountains to the Mississippi River. There, they observed that the remaining Anilco Indians were so dispirited they had neglected to plant their crops. Soto’s survivors, numbering between 200 and 300, constructed makeshift boats which they put into the river at the beginning of July, 1543. Their voyage down the river to the Gulf Coast, and ultimately to Mexico, was hurried along by attacking Indians, determined to the end to rid their lands of the cruel and destructive invaders. The Soto expedition’s chroniclers produced the first eye-witness accounts of Mississippian Indian societies in the sixteenth century. Yet, these accounts raise as many questions as they answer. Who were the Indians mentioned in the Soto accounts? Groups such as the “Chicazas” and the “Tanicos” can be linked to the Chickasaws and Tunicas mentioned in later European accounts. But what about the Indians of Aquixo, Casqui, Pacaha, Anilco, Coligoa, and other “provinces” whose names fail to appear in later historical records? Who were those Indians? Archeologists and historians have made some headway in answering this question and have determined, for example, that the Indians of Quizquiz were probably Tunicans and the Tula and certainly the various groups in the Red River Valley were Caddoan speakers. The identity of many others remains a mystery. The impacts of Soto’s expedition on Mississippi Valley Indians must have been devastating, as communities were attacked, plundered, and disrupted in a variety of ways. Here, too, many questions remain. Soto’s army certainly inflicted much harm on the Indians, but climate reconstructions by dendrochronologist David Stahle show that the mid-sixteenth century was also a time when severe and prolonged droughts prevailed, which added a separate level of stress on Indian communities. It is very likely that the compound effects of the Spanish presence and unfavorable climate changes wrought the most lasting effects. Spanish attack on Indians. From T. de Bry, America. Rare Books Division, The New York Public Library; Astor, Lenox and Tilden Foundations. Not for reproduction. For example, Indian depopulation during the era of first encounters is often attributed to the introduction of European diseases against which Indians had no immunities. Did Soto’s expedition introduce such diseases? Biological anthropologists Barbara Burnett and Katherine Murray suggest that by the time Soto reached the Mississippi Valley, his army probably had long rid itself of potent germs and viruses. But they also acknowledge that Indian population declines did occur in the Mississippi Valley. They attribute the cause of those declines to cultural stresses linked to interaction with the Spaniards and dietary stresses resulting from crop losses. These two factors sufficiently reduced birth rates among young Indian women to result in overall population declines. Other topics raise similar debates: What impacts did the introduction of Spanish trade goods have on Indian communities? To what extent did Soto’s expedition result in population movements and changes in relations between groups that were formerly allied or previously engaged in hostilities against each other? In what ways did the arrival of Europeans alter Indian views of the world? We continue to search for answers to these questions, but one conclusion is certain: when the next set of Europeans entered the Mississippi Valley at the end of the eighteenth century, they observed a profoundly different cultural landscape. 1993 Death, Drought, and de Soto: The Bioarcheology of Depopulation. In The Expedition of Hernando de Soto West of the Mississippi, 1541-1543. Fayetteville, University of Arkansas Press. 1997 Knights of Spain, Warriors of the Sun: Hernando de Soto and the South’s Ancient Chiefdoms. Athens, University of Georgia Press. 2001 Paths of Our Children: Historic Indians of Arkansas. Fayetteville, Arkansas Archeological Survey Popular Series No. 3. 1985 A 450-year Drought Reconstruction for Arkansas, United States. Nature 316:530-532. 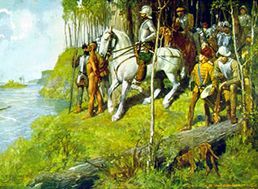 1993 The Expedition of Hernando de Soto West of the Mississippi, 1541-1543. Fayetteville, University of Arkansas Press.